JTB Services was formed in 1986 and since that time we have established an unrivaled reputation for delivering a innovative, safe, and trusted demolition and dismantling services. We own, maintain, and operate a fleet of excavators, dozers, skid-steer loaders, and trucks to ensure we have the right equipment to complete any job. Our highly trained personnel, provide their knowledge and expertise to complete all jobs within OSHA and EPA guidelines. 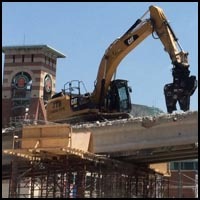 Mechanical Demolition - using cranes, excavators, rams, and dozers to tear down a building. Implosion - placing high powered explosives in carefully selected locations of the structure and detonating them to bring the structure down. Deconstruction/ Dismantling - As the name suggests, deconstruction/dismantling is the opposite of construction. It involves a careful process of dismantling a structure. JTB Services has a proven track record for safely removing all types of commercial and industrial structures. 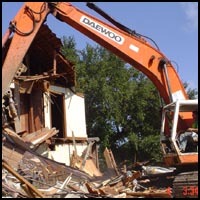 We specialize in various types of demolition and understand that each job has its own unique requirements. Large, multi-story building, grain silos, collegiate stadiums, schools, industrial warehouses, refineries, and manufacturing plant are but a few of types of structures we have demolished. You can count on the experienced team at JTB Services to employ the right method and provide the proper equipment to safely and cost effectively remove unwanted structures. We perform demolition and site restoration for all types of residential projects. 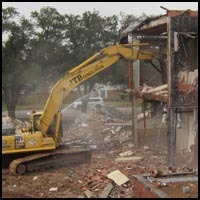 From single-family homes to apartment complexes, JTB Services provides a turnkey solution for your demolition needs. We work with city, state, county, and federal authorities to safely remove residential structures that have become a hazard. JTB offers turnkey services, including utility shut-off, securing permits, demolition, and site clean-up and grading. JTB Services maintains specialized equipment designed to break-up heavy concrete used for highways, roads, airport runways, heavy equipment foundations, parking lots, and commercial and residential slabs. JTB Services Inc. has been in manned equipment rental for over 30 years. We have the manned equipment for your job no matter the size or duration. 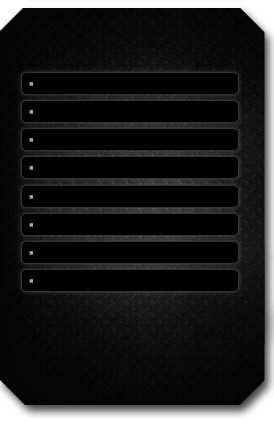 Our operators are some of the most experienced in the industry. If you want to rent a manned rubber tire backhoe to a 50 ton excavator. We supply the operator fuel and equipment at a fair price. We are one of Houston's only manned equipment rental houses. Why rent equipment for the occasional overrun in your work load then hopefully find a experienced operator that will not cause damage to the equipment and the work area. When you can rent the piece of equipment with a experienced operator and maintained. We can usually have a operated piece of equipment on your job within four hours.